SHOCKED parents and teachers gathered on the school grounds of Hoërskool Driehoek in Vanderbijlpark on this Friday morning as paramedics worked to try to retrieve the bodies of three pupils who were killed when a walkway collapsed. The children died at the high school in Vanderbijlpark after a walkway collapsed on Friday morning. On teacher told newspapers that the walkway collapsed as children returned to class after attending assembly just after 08:00. At a briefing, Gauteng Education MEC Panyaza Lesufi confirmed that three children had died. He said the deceased included two boys and a girl. Only one of the deceased has been identified. The department is still trying to locate the parents of the other two children so they can notify them. A teacher told news that the walkway collapsed over children as they returned to class after attending assembly just after 08:00. “Multiple people have sustained injuries, ranging from minor to moderate. At least five people are in a critical condition,” Netcare’s Shawn Herbst said in a statement. At least 26 pupils were injured. Ward councillor Phillip Nothnagel said the walkway connected two buildings. “Structural engineers were called to the scene together with building inspectors. “They assessed the place to ensure that it is safe. We sympathise with the families and we call on them to avail themselves for counselling, including everyone who is affected,” he said. Jacques Pelser told news media that he dashed to the school after hearing the news of the tragedy. “I thought my niece, who is a student at the school, was among the injured,” he said. “I am still in shock about what I’ve seen.” Pelser refused to describe the scene, which was closed off to the media. However, he told news that he was grateful that his niece, who is in Grade 10, was safe. “My condolences to the families of the deceased. No parent wants to lose their child. “I don’t think I will be able to sleep tonight I am going to the doctor to obtain pills that will assist me to sleep,” he said. The school was shut down with immediate effect. The problems of this kind was reported many a time to Lesufi’s department – asking fro repairs- but the careless answer from his useless department always was that there is “ no money “to do this much needed repairs- but BILLIONS are stolen each year by Lesufi’s cadre criminals. Now the ANC is very quiet- not a WORD about negligence from Lesufi’s department’s side. AS could well be expected of the very sick and diversified society of South Africa – there also was some racist psychopaths that wanted to turn this tragic event into a race-related incident. A black man from KwaZulu-Natal is facing a backlash after saying he can’t ‘feel pain for white kids’. Facebook user Siyanda Dizzy Gumede may have gotten more of a response than he bargained for when he commented on a post on SABC News’ Facebook page this morning about the breaking news that at least three school pupils were killed in a walkway collapse at their school. 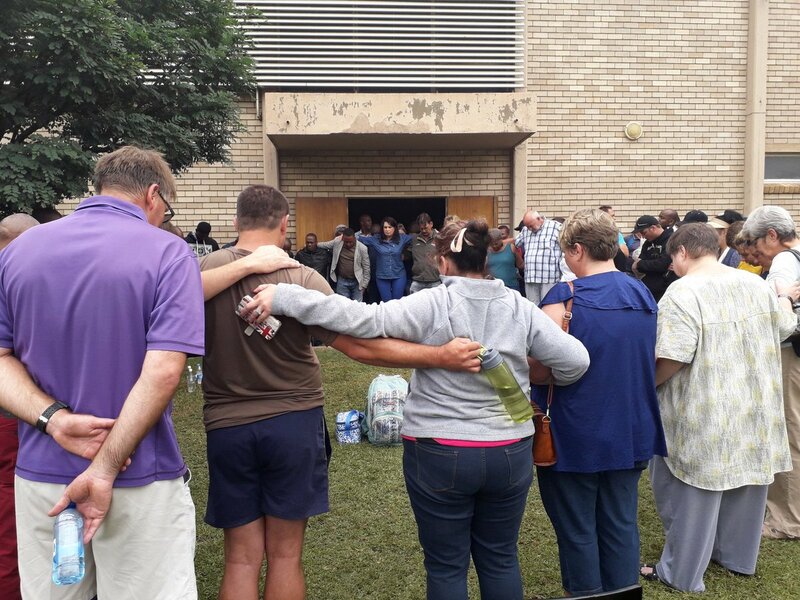 Hoërskool Driehoek was being rocked by the tragedy, which also trapped other youngsters in the rubble and immediately saw emergency and department officials rushing to the scene. Gumede, operating on the assumption that the Afrikaans-medium school could only have white pupils in it – since the race of any victim has not yet been reported on or been considered relevant to the story by any reports – said that he was unmoved by the deaths and that the world was now free of “3 future problems”. “Don’t have heart to feel pain for white kids,” he said, in screenshots that were taken before the comment could be deleted. Among the nearly 70 other replies to him, Matshidiso Matla said: “You are disgusting wena..imagine if it was yur child involved in the incident.” Another user pointed out that the school was dual medium, and he was simply wrong. Gumede has subsequently blocked his Facebook account to the public. It is currently being targeted with numerous messages of anger and outrage from, particularly, white users who want him to be found and taken to task for his callous comment. Several of them have now also been threatening various forms of violent reprisal against him. 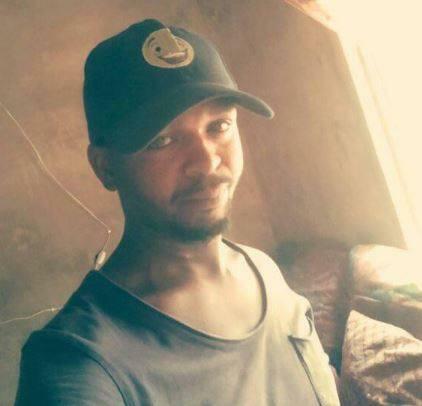 In his profile, he describes himself as a “Free thinker and gamer” who is into graffiti, tattoos, anime and books and lives in Mtubatuba in KwaZulu-Natal. 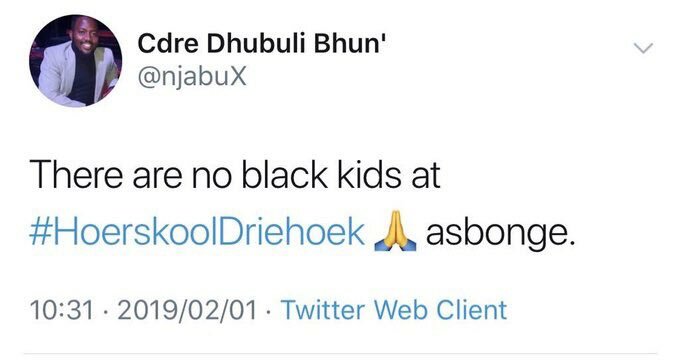 Sadly- Gumede is not the only one who expressed this sick view today that the victims at the school must be white, and therefore, somehow, that this has made their deaths less of a tragedy. Lindsay Maasdorp– another very deranged social criminal of the BLF ultra racist black group also had a very disgusting reply. “God is on our side” the deranged cretin said. Advocate Anton Alberts -VF Chair person said that the Human Rights Commission must investigate this blatant racist utterances with the same vigil it investigates when white people are investigated for alleged “racism.” It already is general knowledge that the Human Rights Commission is a bias organization only protecting the best interests of non-white races- but have no respect or equality where white people are concerned. Alberts said the VF-Plus will closely monitor the Human Rights Commissions actions against this despicable disregard for the life of even innocent children. UPDATE: 02/02/2019- SADLY another child has died in Intensive care today- bringing the death toll to 4 children. Condolences to the parents from all of us. White Nation sincerely want to convey the condolences with the deepest regret from it’s Administrator, Editors and correspondents to the grieving families of this unfortunate children.